Provide comfort for the family of Patricia Perea with a meaningful gesture of sympathy. 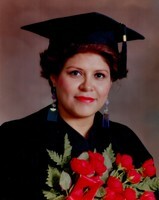 Visitation for Patricia Perea nee Ordaz of Elgin for 20 years will be held Saturday, April 6, 2019 4:00p.m. until time of service 8:00p.m. at the Countryside Funeral Home and Crematory 95 S. Gilbert Rd. (at State St.) South Elgin. Following services, cremation will be private at the Countryside Crematory. Patricia is the beloved wife of 34 years of Carlos A.; loving mother of Karla and Daniela; cherished daughter of Jesus and Concepcion Ordaz nee Martinez; dear sister of Jesus, Sergio, Alejandra, Guillermo and the late Maria; many loving nieces, nephews and cousins. She will also be missed by her pet turtle Tori. (847) 289-8054.